I had Alan Fisher's papers on the dashboard as the old chevy rumbled up Carson Pass. It stopped at the overlook and I marveled at the beauty of Red Lake below. The campground at the dam was laced with the gold colors of fall. A lone flyfisbherman stood perched on a rock just offshore. Upon closer attention I realized that the man was stark naked with the exception of a small pair of blue jockey shorts. After exchanging pleasantries he directed me in a strong German accent to where the brookies where biting. 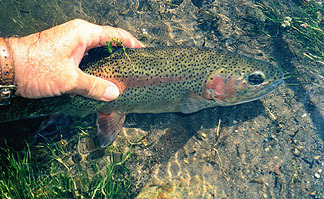 That evening I landed a nice 15" cutthroat and the following morning I released a couple of 14" spawning brookies. On to Heenan Lake! Heenan Lake proved to be a little difficult this year. On Friday the sky was overcast and the fishing was quite good: most anglers caught a fish every half hour. Saturday and Sunday were bluebird days without a ripple on the surface. Most of us averaged a fish per hour. The numbers don't tell the whole story, however. Wayne Taylor Jr. landed 5 cutthroat. The largest was tape measured to be 26" and weighed about 8 lbs. All of us caught fish weighing 3-4 lbs. I had heard reports that Heenan lacked scenic beauty. Not so! It was pleasant just paddling around the lake in the stillness and watching the evening colors and shadows change with the setting sun. There were several canoers that silently glided along and they seemed to capture the essence of the place. By Monday I had worked my way south to the town of Bridgeport (a peculiar name for a settlement that's 350 miles from the nearest ocean). I dutifully pulled up to Ken's Sporting Goods store and examined the frozen trophy trout in the curbside freezer. Inside, an attendant sat tying San Juan worms. "Don't bother with Kirman Lake", he told me. 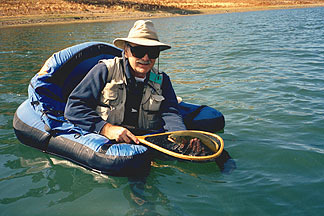 "Those fish are spawning and will not take a fly". Usually I don't question a local's veracity but this was contrary to my experience at Red Lake just two day earlier. The following morning I was huffing and puffing along through the sagebrush high desert to the lake. It was a windy day and a cloudburst welcomed me as I reached my destination. The lake is entirely encircled with tules. However, the southern bank was shallower. It's tules extended further from shore and weed beds continued beyond the tules for another 80 feet. The spawning brookies were in the shallows over these weed beds. 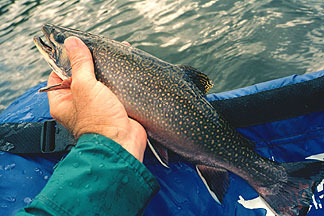 During the following five hours I landed over 20 brook trout, all 13-16 inches. They took a prince nymph readily and I saw no reason to change. The takes were agressive and the fish fought spiritedly. I tried to capture some of their beauty on film by shooting while the subject was still in the water. I was marginally successful. You may judge for yourself. The lake was largely abandoned except for a couple of flyfishers who stayed in the same spot all day. I later discovered that they were fishing a 20 foot section of a feeder channel that was stuffed with spawning fish. I tried my luck also and found success to be too easy. The hike out was exhausting. I must be getting older. One and a half hours later I stumbled back to the truck and heaved my pack off. That evening, at thc local bar, I watched the 49ers beat the Falcons in overtime - a happy ending to a good day. The next day my thoughts turned to Lake Crowley, or rather, the trophy trout of Lake Crowley. On the way south I marveled at the spiritual beauty of Mono Lake. 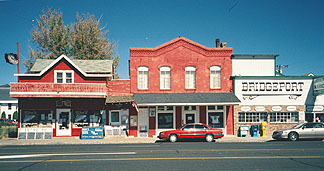 Lee Vining is one of my favorite towns in the eastern Sierras. I thought how fortunate it's residents must be to wake up each morning to that broad body of pastel blues stretching endlessly to the horizon. Mammoth Lake was another story. The yuppy ambience, upscale restaurants, and general size of the community seem to deprive the town of the character of the previous stopovers. It's essentially an alpine version of Carmel. Mammoth seemed to have more fly shops than the Bay Area. I learned that Lake Crowley was off this fall and so, proceeded to Hot Creek. My last recollection of Hot Creek had been one of a summer evening 30 years ago where I proceeded to drink an enormous quantity of cheap red wine that stayed with me for the next 2 miserable days. The water directly upstream from those hot springs has some excellent fishing. I was amazed at the richness of Hot Creek. Rich, luxuriant weeds covered the entire bottom, often reaching to the surface. You could see large trout scurrying for cover as you walked the banks. 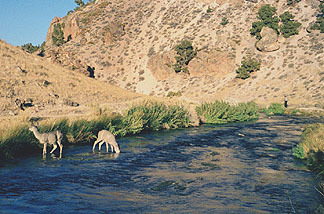 Mule deer waded every evening down to the water and foraged on the submerged flora. Clark's nutcrackers swooped down from the junipers to drink the clear water. And the swallows were everywhere during the hatch. The hatch was rich and diverse. Blue winged olives came off daily from 10AM to 2:30PM, giving you the opportunity to fish dries for a solid 4 1/2 hours. After numerous changes a size 20 Stalcups CDC blue winged olive proved to be the right choice. The best fish were holding tight against the banks or in the deeper openings between the weeds. I landed 4 rainbows in the 15"-16" range that had a vitality that, well, that only a rainbow has. I was pleased. On the way back to the Bay Area I had another visual discovery that I want to share with you. At the base of the road up to Monitor Pass lies a lake whose beauty is stunning. 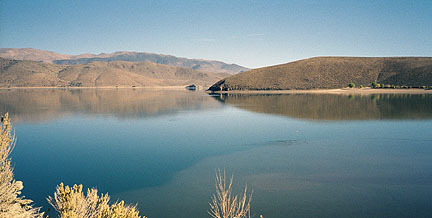 Appropriatly name, Topaz Lake, it appears to be a small version of Mono Lake without the salinity. During the morning I arrived it's still blue waters reflected the distant desert buttes AND there were sizeable rings across it's entired surface. The lakeside resort I subsequently visited had huge trophies mounted of brown, rainbow, and lahontan cutthroat trout. This, I decided, was a place that needed further investigation.